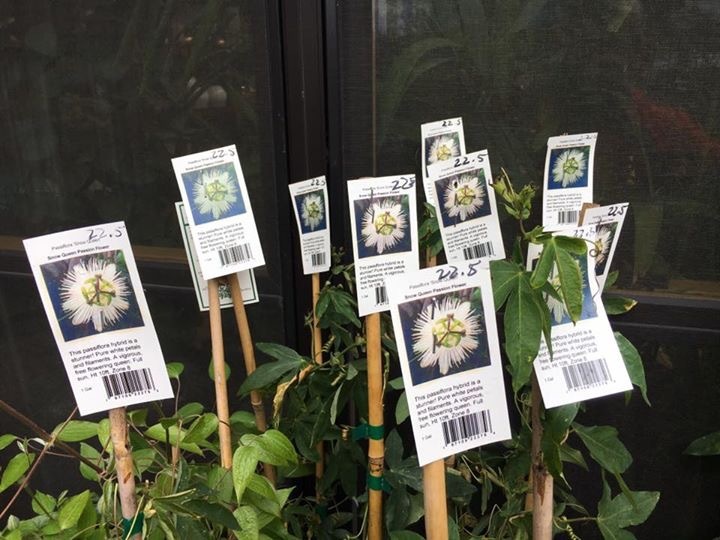 Myles Irvine has been growing Passiflora for over 30 years, releasing a number of hybrids over that time. 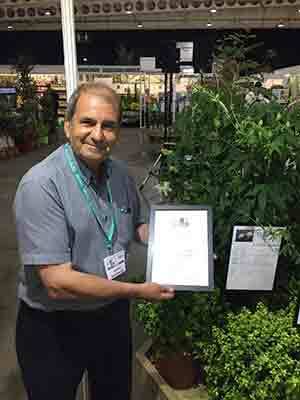 The best have been selected for worldwide distribution as the Riverside® hybrids. 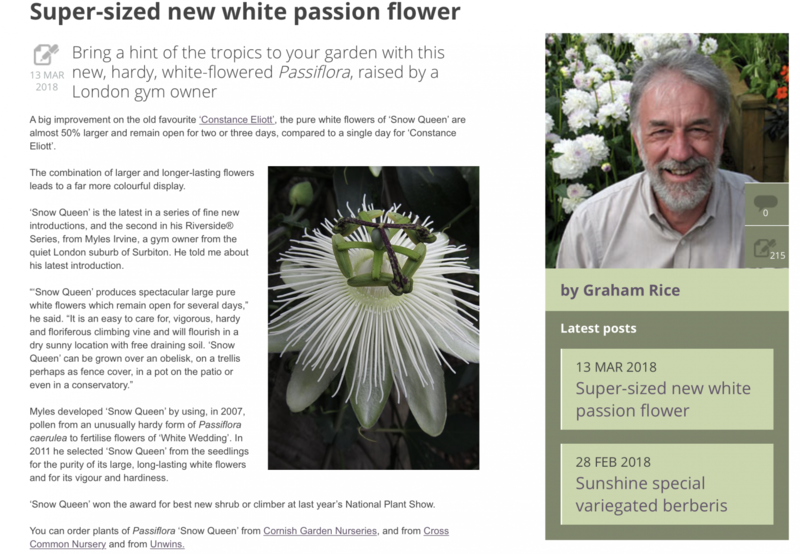 He also created the Passiflora Online site back in the year 2000, started the Passiflora Online Facebook Group in 2007 and is editor of the free to download Passiflora Online Journal. 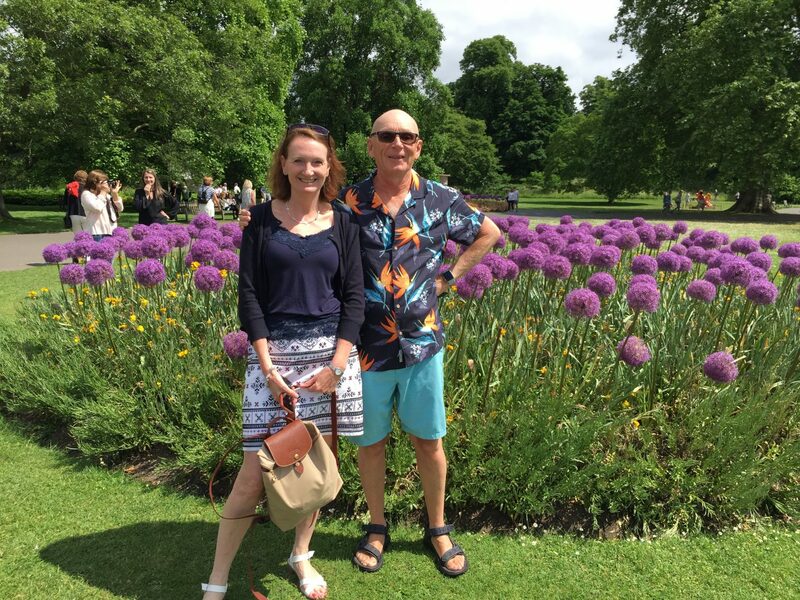 Fun Easter visit on the hottest day of the year with Ann & Lucy Morling to Royal Botanic Gardens Kew. 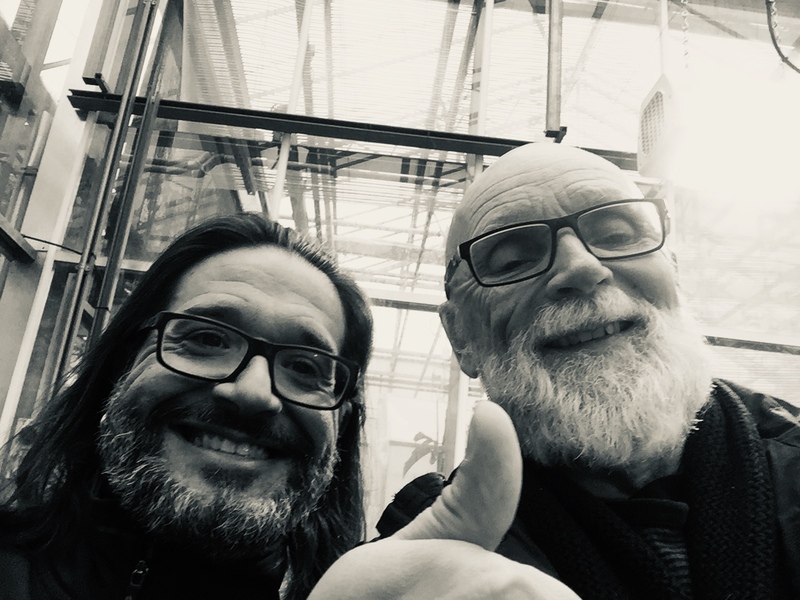 Lunch with Carlos Magdalena and spotted Passiflora emarginata in flower in the Princess of Wales Conservatory.. Fabulous. 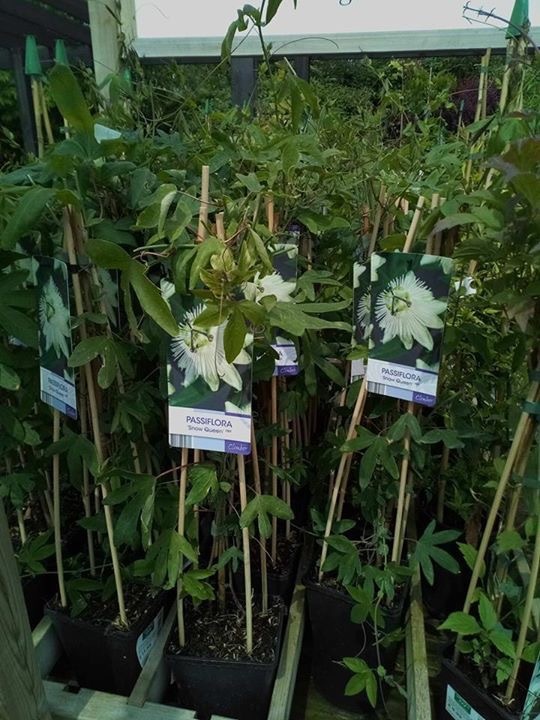 Great to see some terrific new labels for 2019 for the Riverside® hybrids Passiflora ‘Damsel’s Delight’ and Passiflora ‘Snow Queen’. 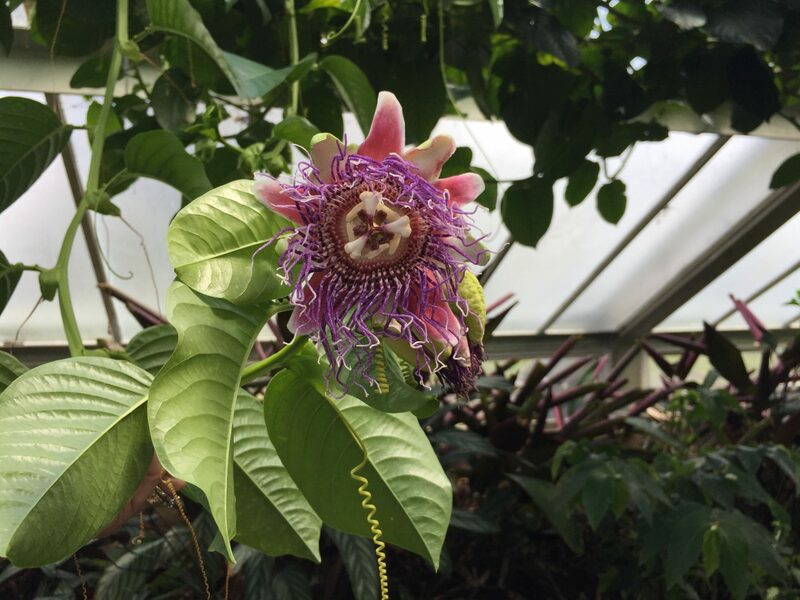 Both hardy hybrids. Pic ©Tim Scrijver. 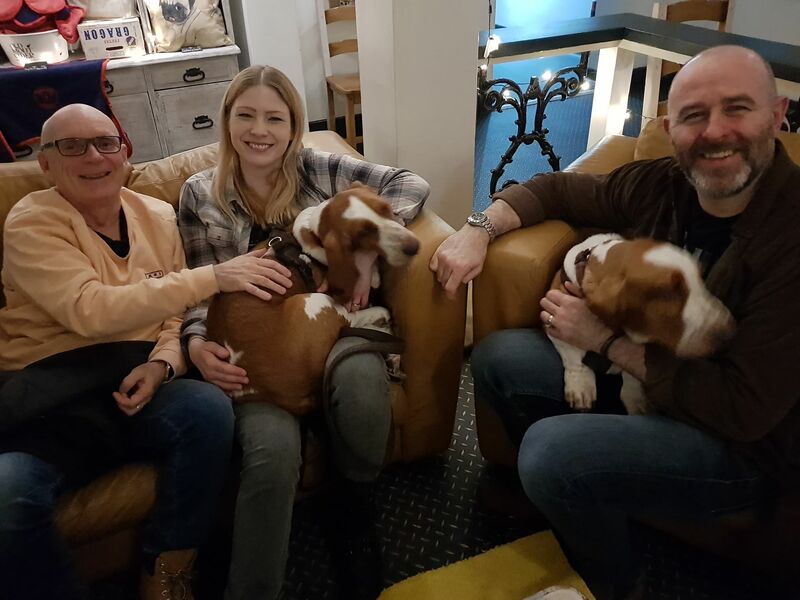 Great catch up at Wags N Tales With Passiflora enthusiast Martin Murray, wife Jen and the two Basset Hound pups, Oscar and Rosie! Here’s a bit of fun. 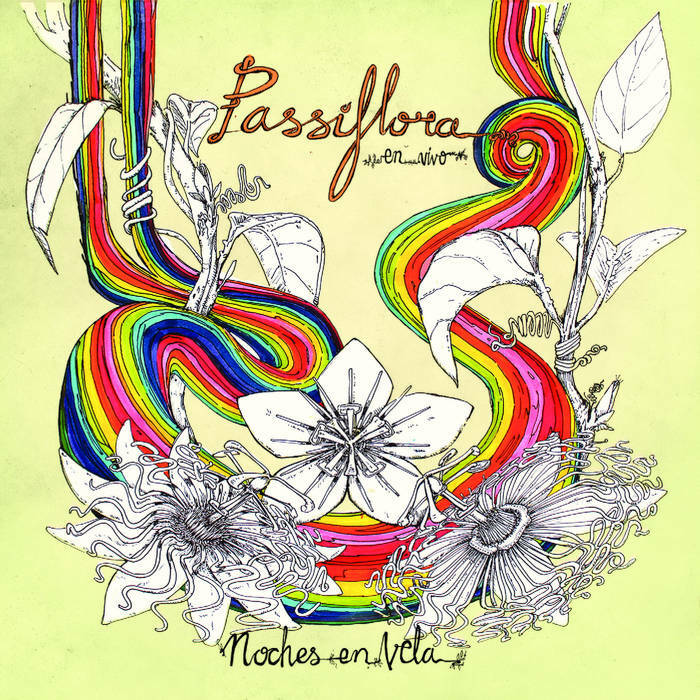 A band called Passiflora from Costa Rica have released a track called Riverside! Very good it is too. 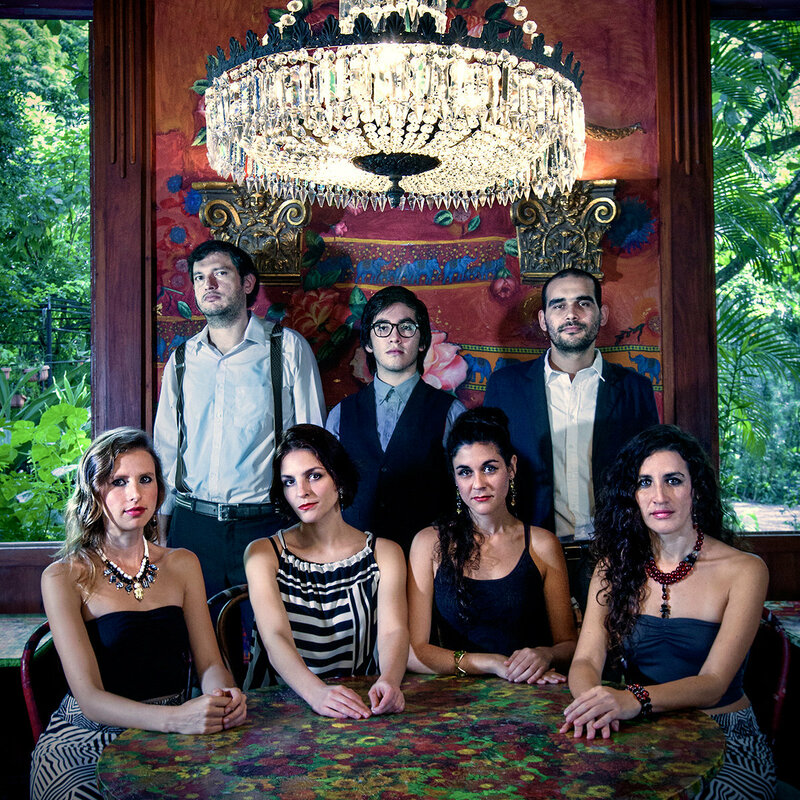 Listen to it and buy here. 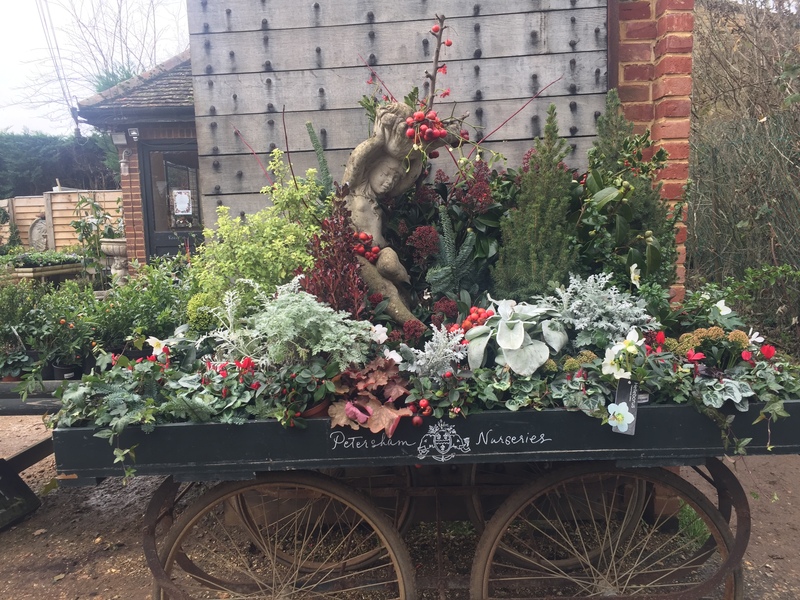 Visits to Petersham Nurseries. 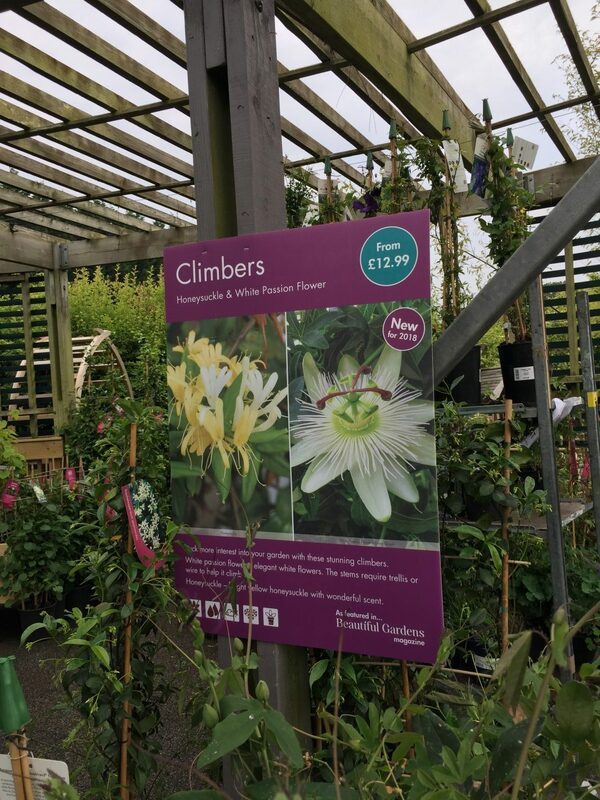 A lovely place and pleased to see them selling Passiflora ‘Snow Queen’ and Passiflora ‘Betty Myles Young’ outside, and looking far better than the adjacent defoliated Clematis! 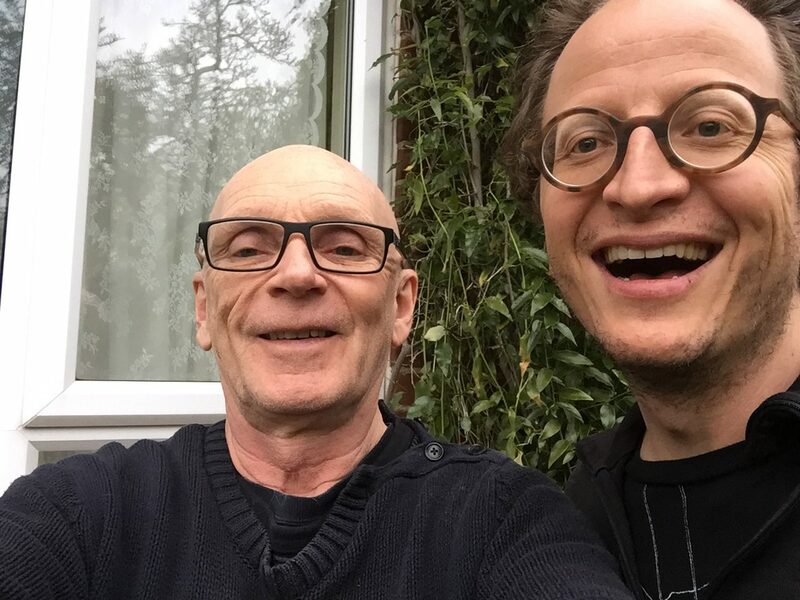 Visits to Kew Gardens with Sal La Delfa, Laura Rowlands and solo. 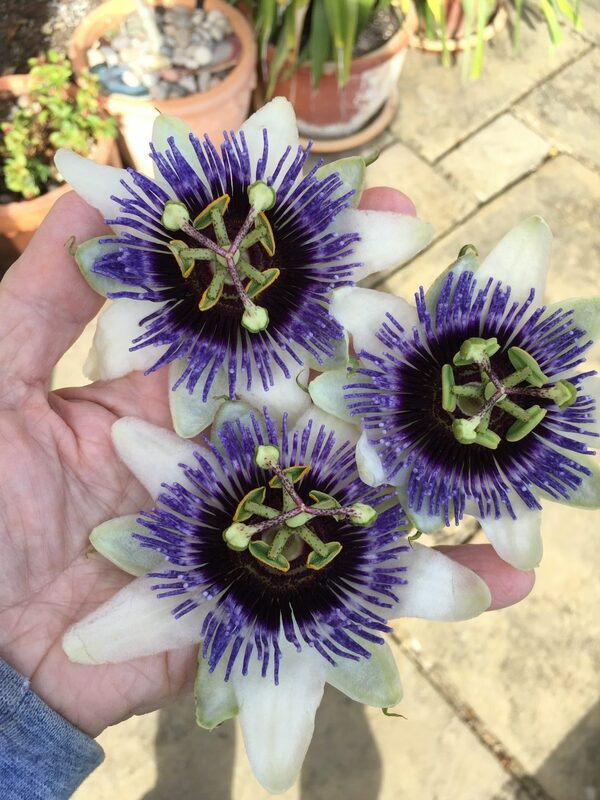 Met up with Carlos Magdalena and saw the incredible Astropheas Passiflora rusbyi and Passiflora emarginata in flower. 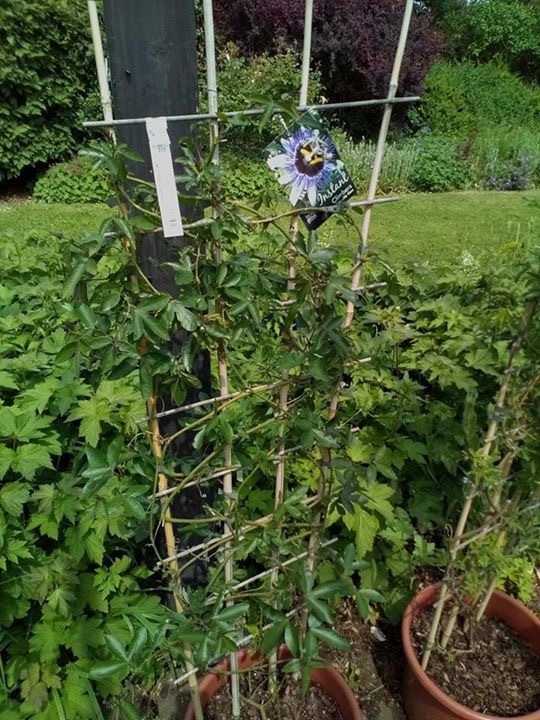 Some of the crosses I attempt seem to take forever to ripen. This fruit dropped a bit green and is now ripening to yellow under grow lights in my propagator. It is now producing a nice passionfruit smell. 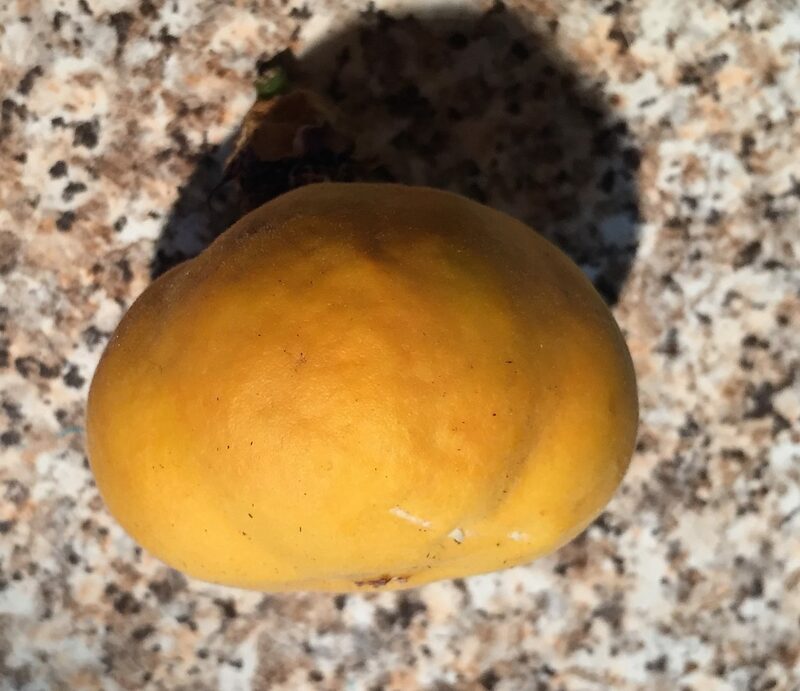 It is a unique polyploid fruit and if all goes well, sometimes seeds are not viable, should produce some exciting plants in 2019. 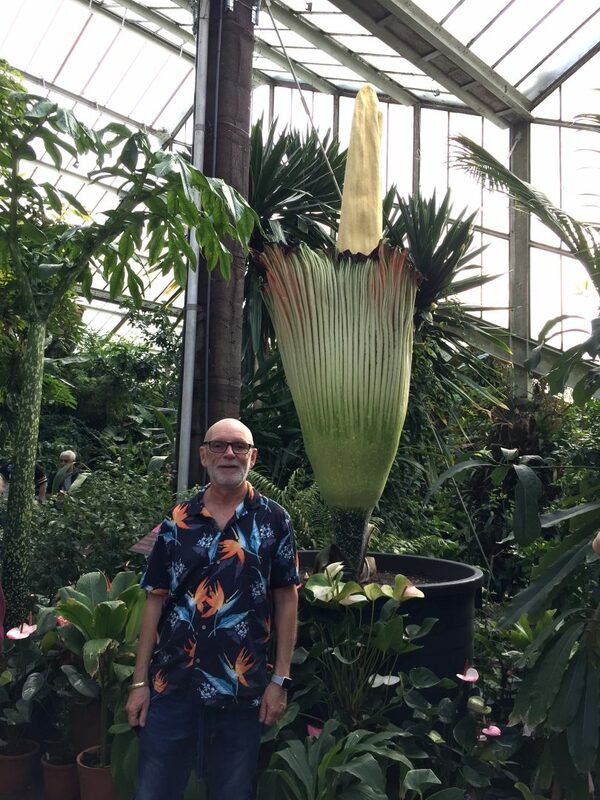 Great fun with Andrea Dudas checking out Amorphophallus titanum and more. 118K tuber. It was its second day of opening so the intense smell had faded but nevertheless a distinctly unpleasant smell of death and decay. At least I think it was the plant. Evolution is amazing. This is the largest unbranched inflorescence in the world. 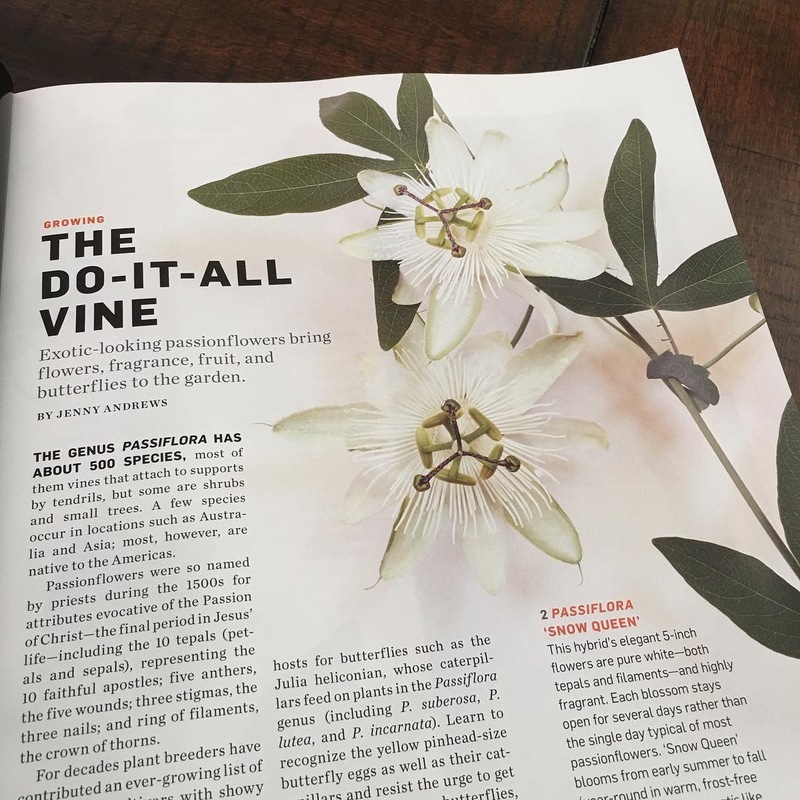 There are often many years between it coming up in this form, with intervening years in the vegetative leaf and leaflet form. So, as it rarely selfs, to be pollinated it needs to come up in the same year as others nearby enough for the carrion beetles & flies to get to both and in the same 24-48 hour period. That’s some timekeeping. Native to Java and Sumatra. 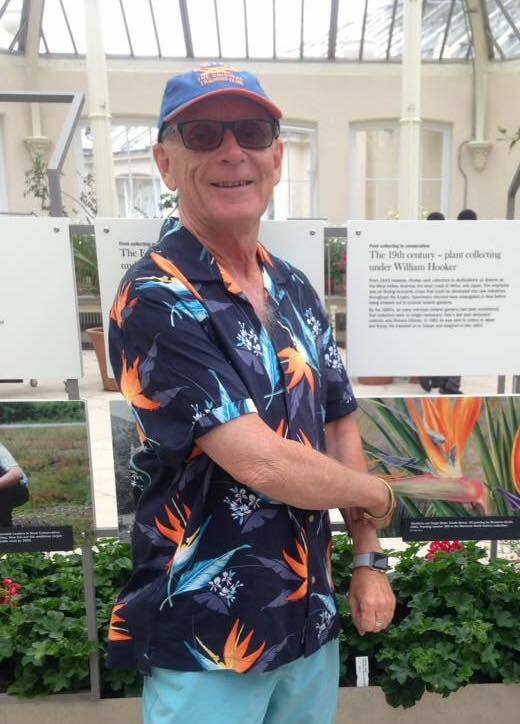 Yet another visit to Kew Gardens. This time with Ann Morling and Markus Varga from Austria. 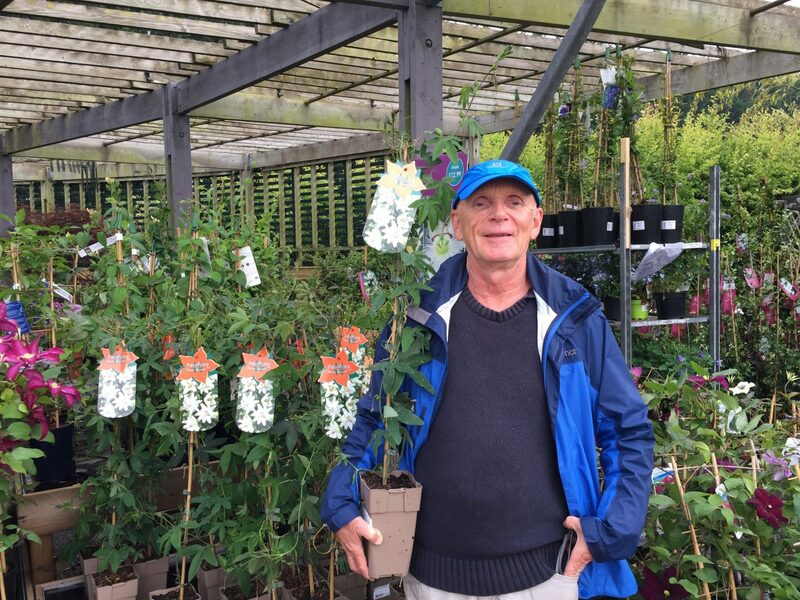 Markus has one of the best private collections of Passiflora species in Europe, housed in a purpose built climate controlled 9m x 9m greenhouse built on top of his house! 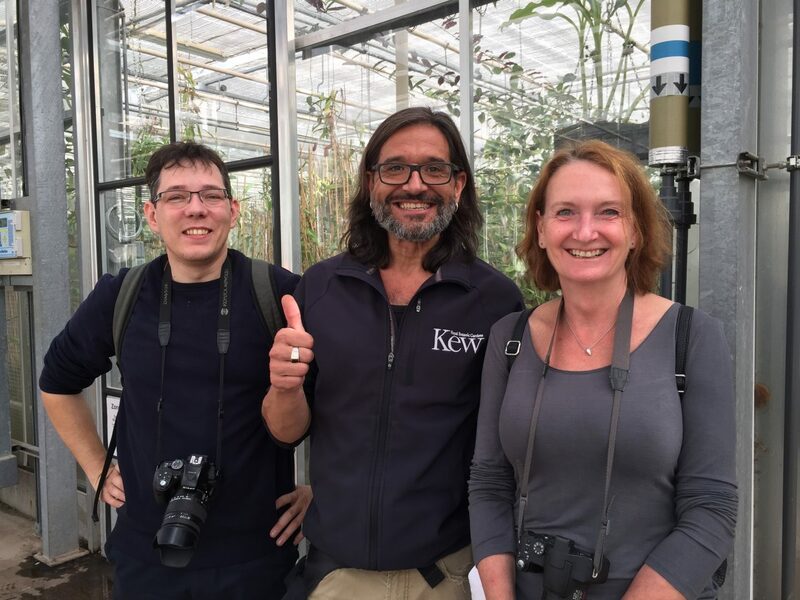 Great to catch up with Carlos Magdalena and Lara Jewitt in the Tropical Nurseries. Ann Morling & myself off to RHS Wisley for the day. 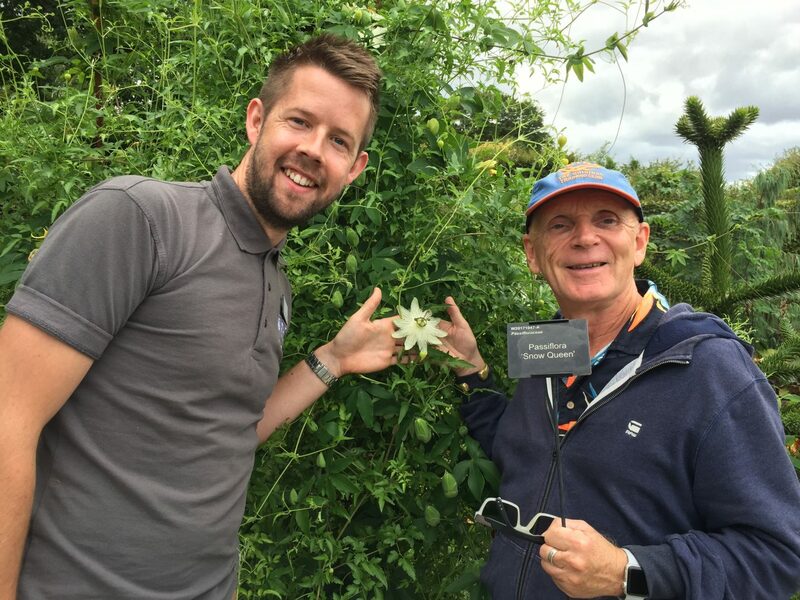 Met up with Matthew Pottage, the Curator of Wisley, he and his team have made amazing improvements since my last visit, including the Exotic Garden c/w Passiflora ‘Snow Queen’. 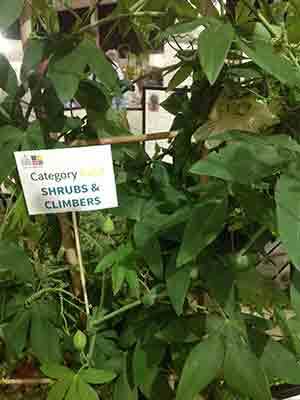 So exciting also to see some of my other hybrids on the Laboratory building wall, including Passiflora ‘Damsel’s Delight’, ‘Justine Lyons’ and ‘Star of Surbiton’. 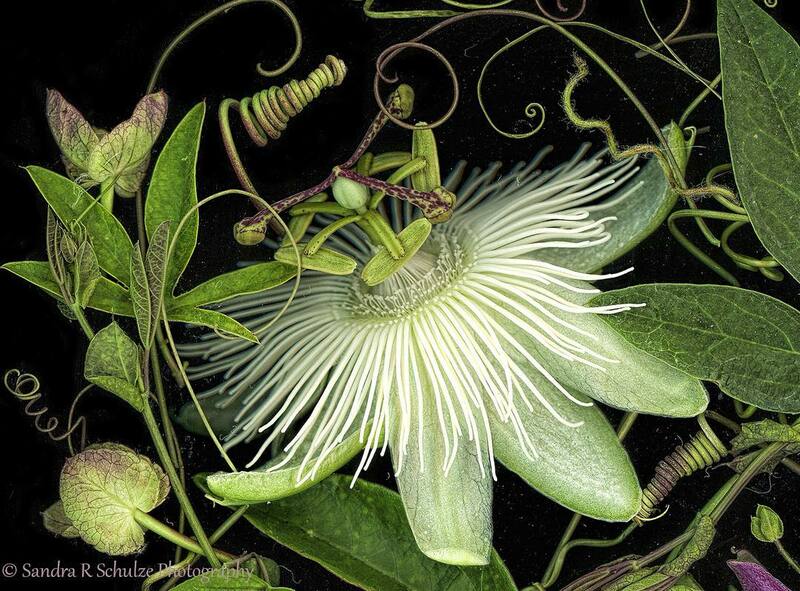 Beautiful scanner artwork © Sandra R. Schulze. 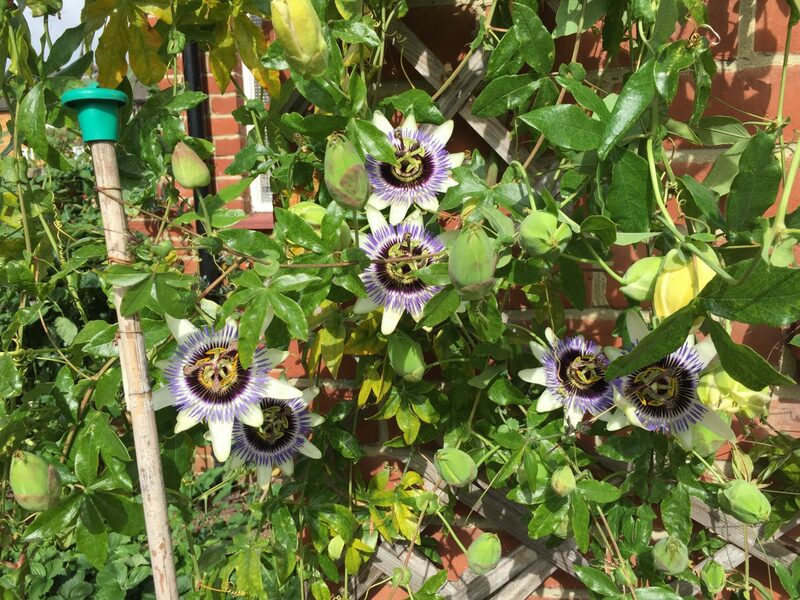 Amongst others, my hybrids Passiflora ‘Betty Myles Young’ top right and Passiflora ‘Snow Queen’PVR top left. Excitement. 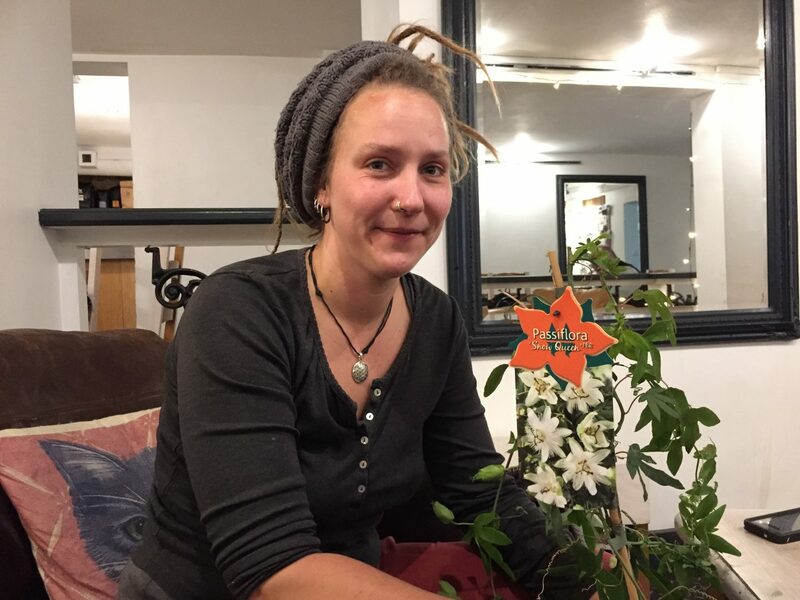 A six minute slot on BBC Radio 4 Gardeners Question Time. 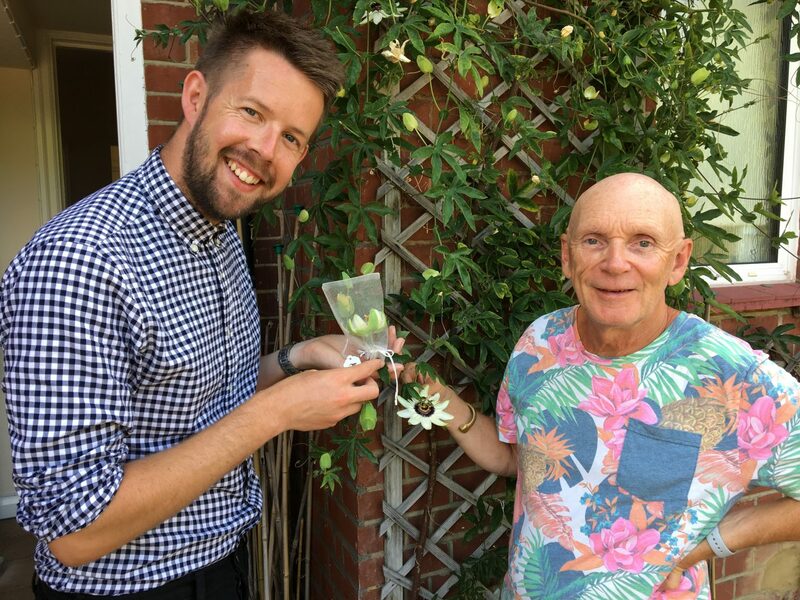 Interviewed by Matthew Pottage Curator of RHS Wisley, produced by GQT Editor Darby Dorras. From 14.20 to 21.40 minutes in link above. 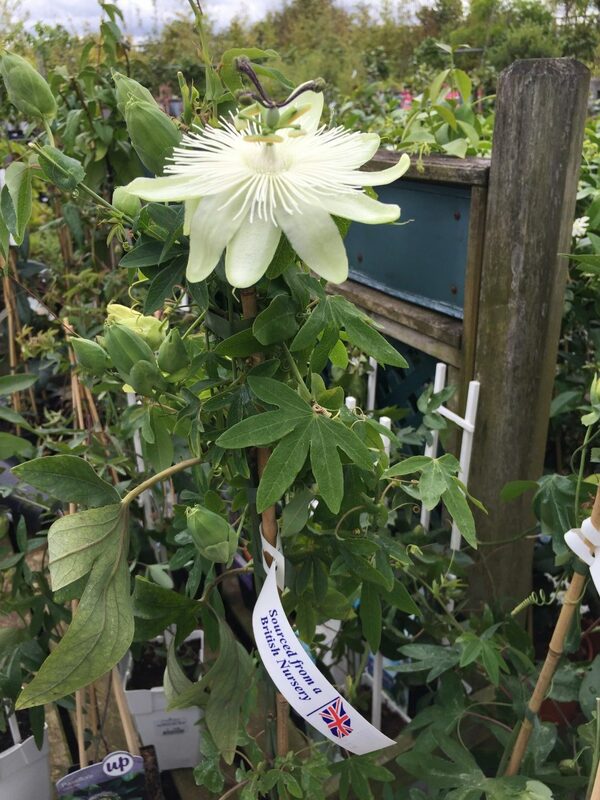 To my amazement a colleague reports that he has seen a Passiflora ‘Snow Queen’PVRin Iran, produced by one of our Authorised Wholesalers, Clearview Horticulture of Canada. 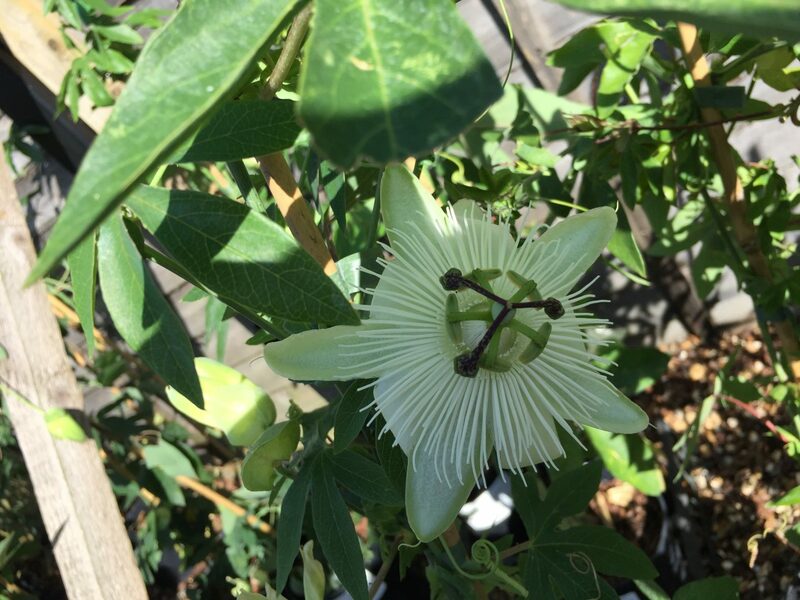 It is flowering even in 38°C. 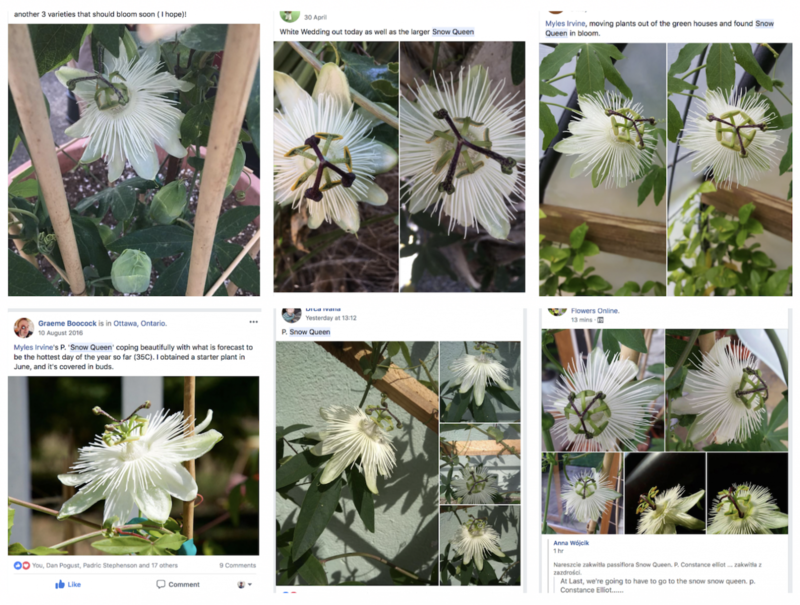 Lovely to see plenty of satisfied customers reporting their excitement at the garden performance of Passiflora ‘Snow Queen’PVR on Social Media, including Facebook, Instagram and Twitter. 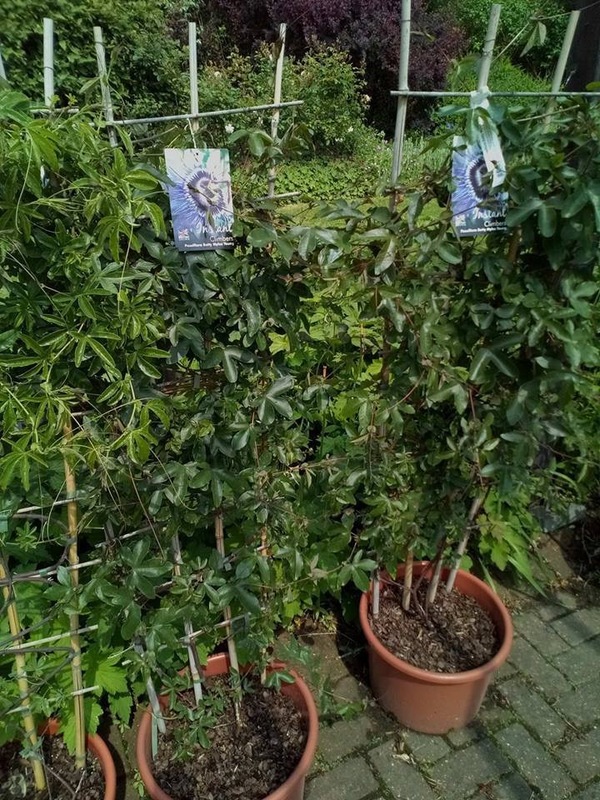 She thrives in all sorts of different conditions, from Canada and USA to all over Europe from France to Hungary, Poland, Germany, Czech, Spain (flowering in 32°C) and more. 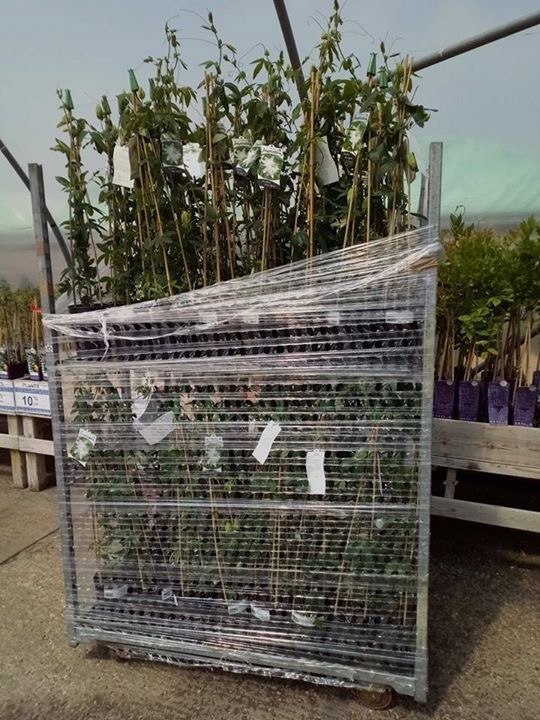 Thanks to Lawrence Wright Head Plantsman at Tregothnan for buying these beautifully packaged Riverside® Passiflora hybrids from Carnon Downs Garden Centre! 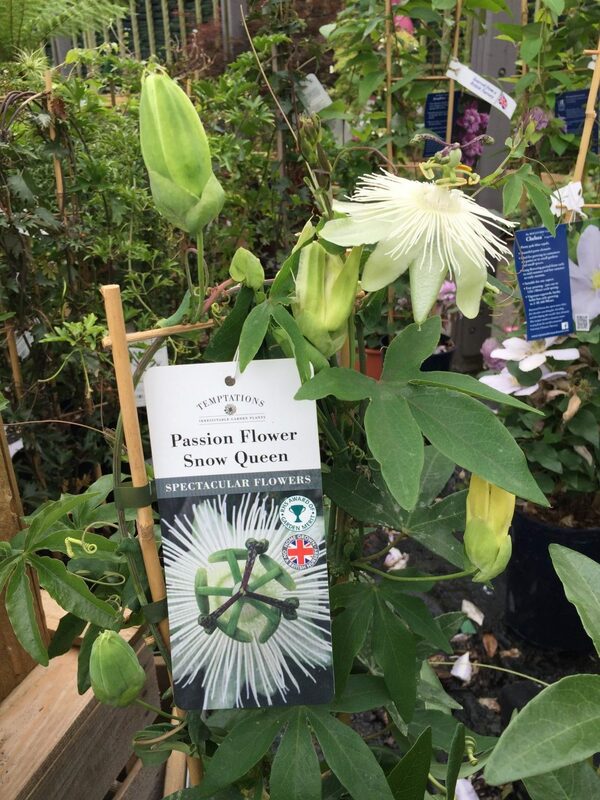 Great to see a new delivery of Passiflora ‘Snow Queen’PVR in flower, under the Temptations “Irresistible Garden Plants’ label, grown in a British Nursery by Darby Nurseries. 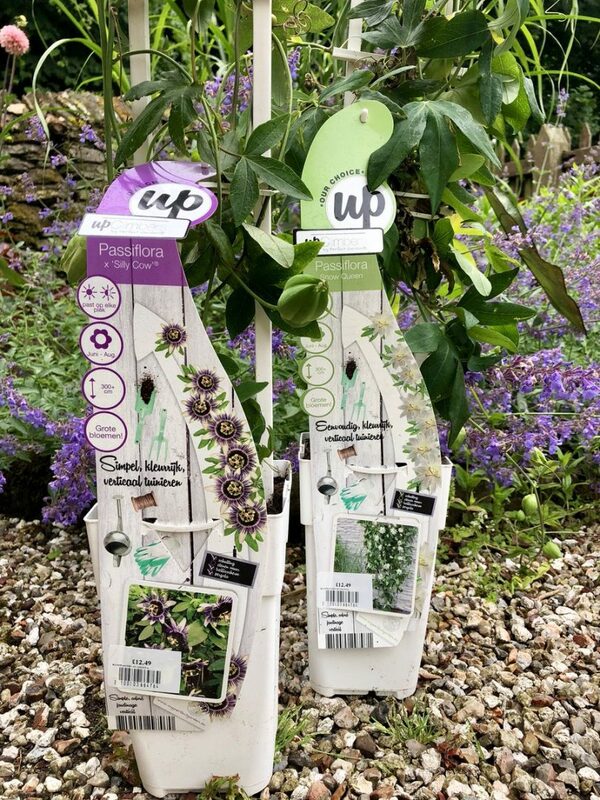 Available from Squire’s Garden Centres. 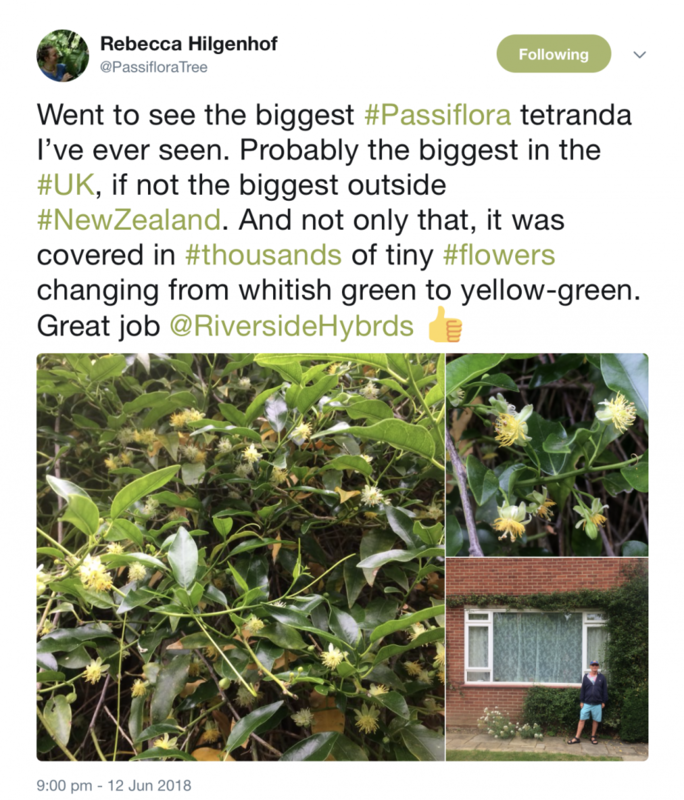 Rebecca Hilgenhof, Tropical Nursery Supervisor at the Royal Botanic Gardens Kew popped round to see an incredible Passiflora tetrandra from New Zealand covered in thousands of tiny flowers & also checked out the mysteries of polyploids. 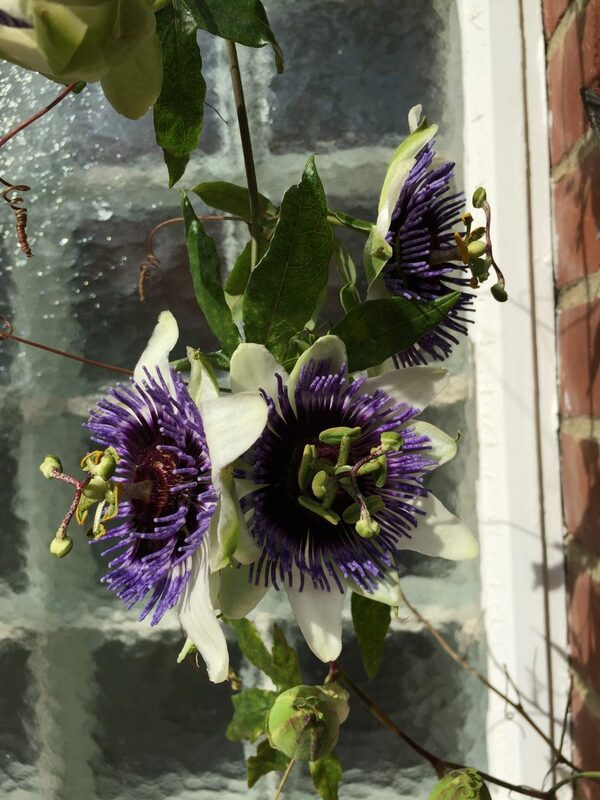 Not only that but she kindly collected a Passiflora ‘Snow Queen’PVR for Carlos Magdalena’s ‘Barnes Botanical Garden’ at his home! 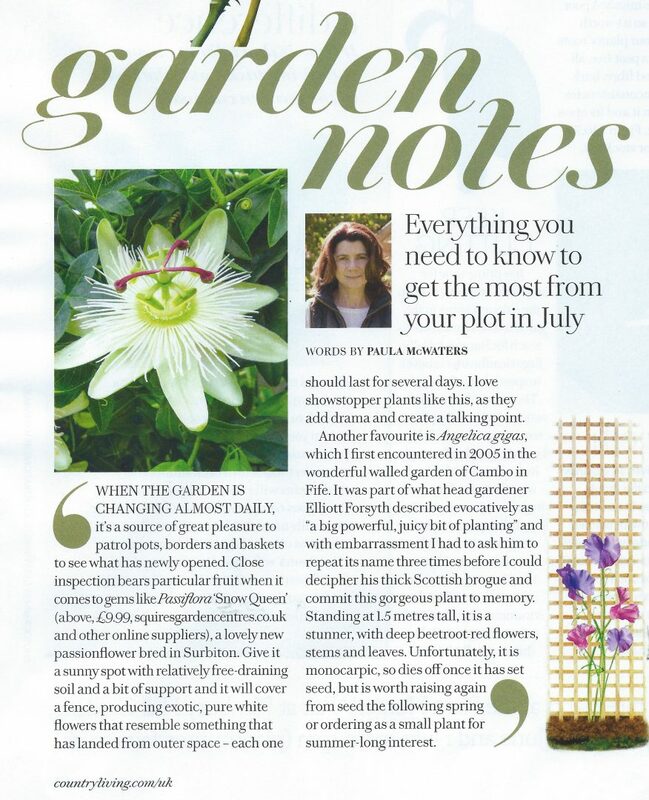 An article by Paula McWaters in Garden Notes, Country Living Magazine July Edition, recommends Passiflora ‘Snow Queen’PVR available from Squire’s Garden Centres. 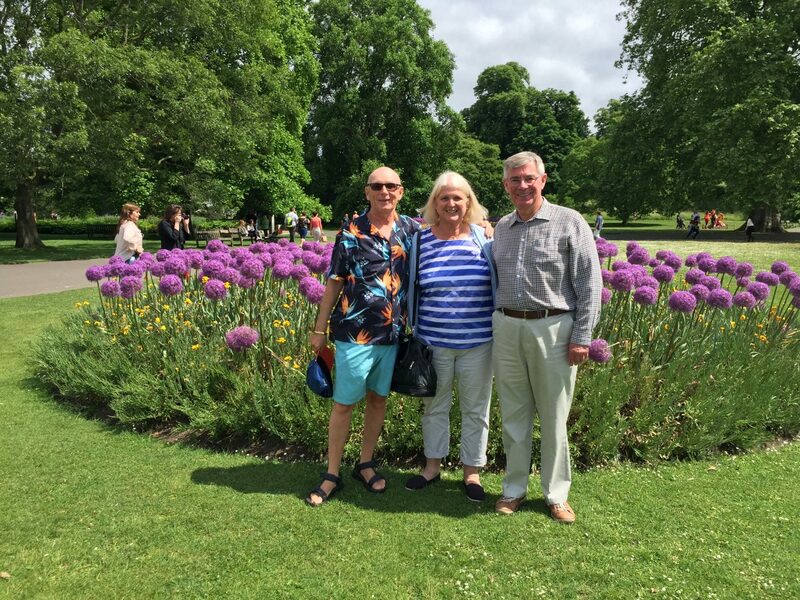 A fabulous day out at Kew Gardens with Ann Morling & the PlantHaven Team, Geoff & Maureen Needham, who look after the Riverside® Passiflora Hybrids worldwide. 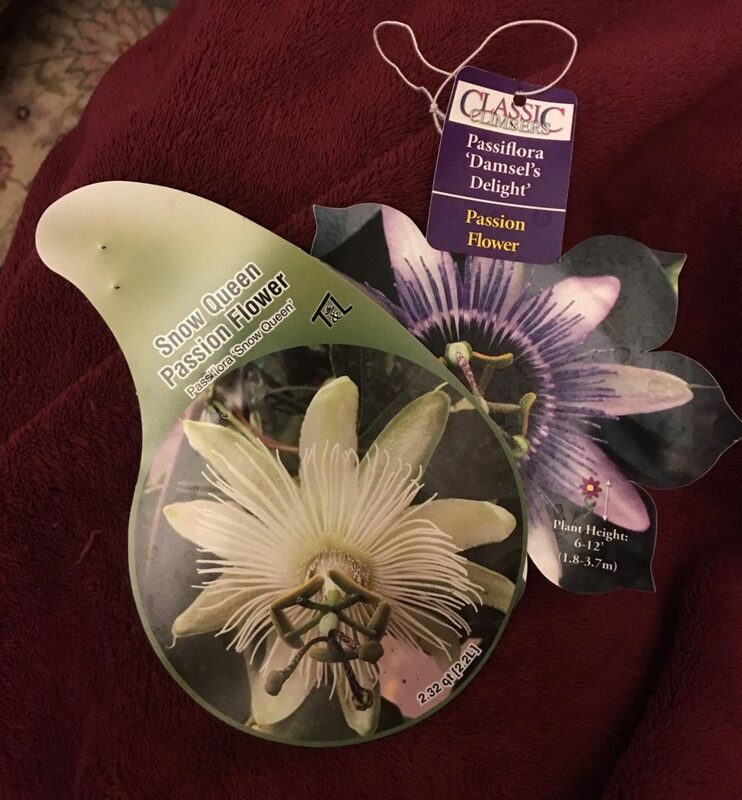 Sandra R Schulze reports Passiflora ‘Damsel’s Delight’ and Passiflora ‘Snow Queen’PVR now available in the Pacific North West USA! 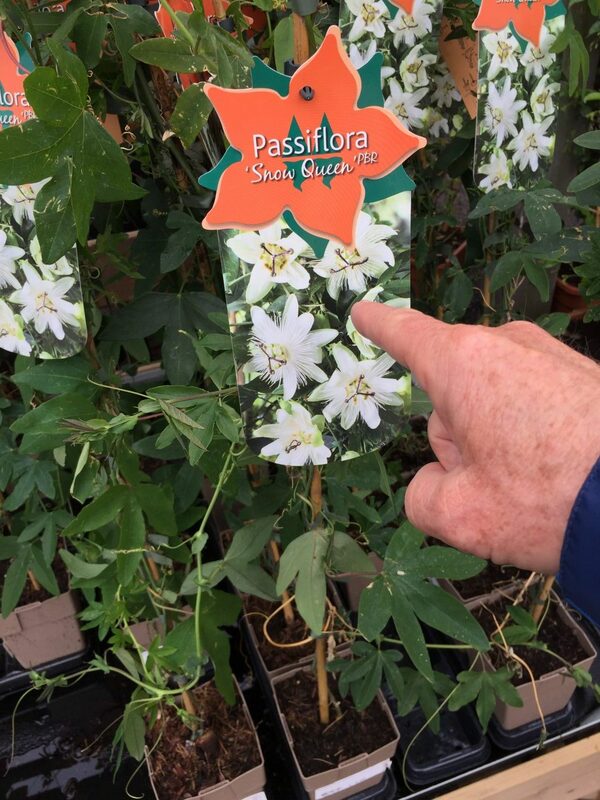 Sal La Delfa kindly reports that the only Passiflora Frosts Garden Centres had in stock when he visited were my Riverside® Passiflora hybrids! 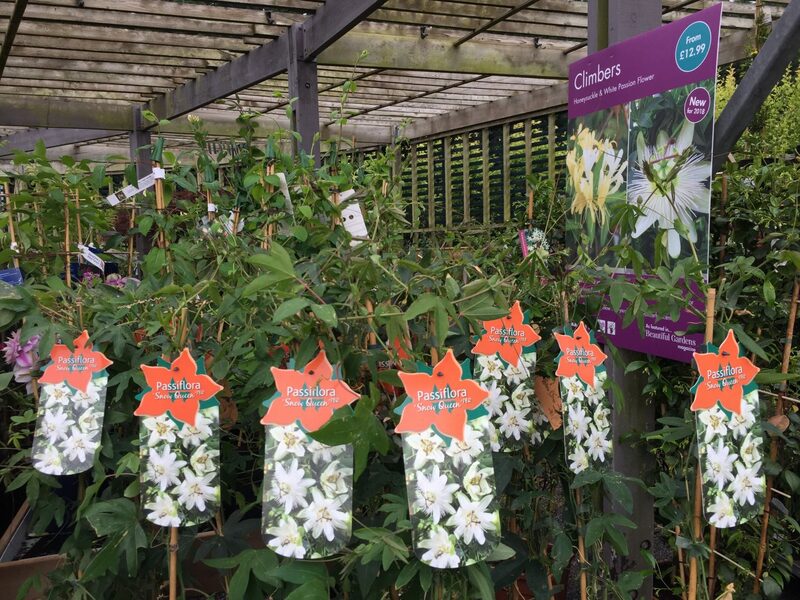 Pleased to see a lovely display of a veritable forest of my Riverside® Passiflora ‘Snow Queen’PVR hybrids at Squire’s Garden Centre – Long Ditton.Buy Passiflora ‘Snow Queen’. 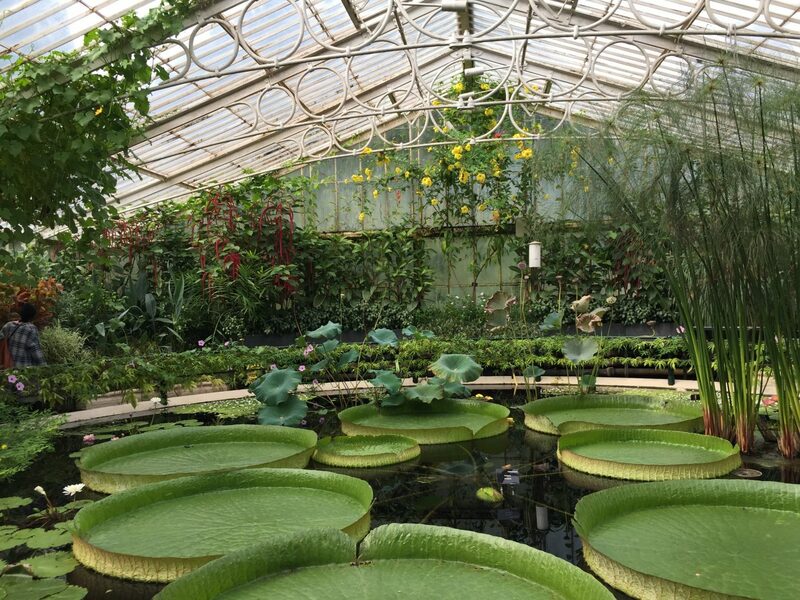 Excited to attend with Ann Morling the recording of Gardeners’ Question Time in the Temperate House at Kew Gardens, a week before it was open to the public. £41 million spent on the refurb but looks incredible. Just need to wait 50 years for all the plants to grow into it. 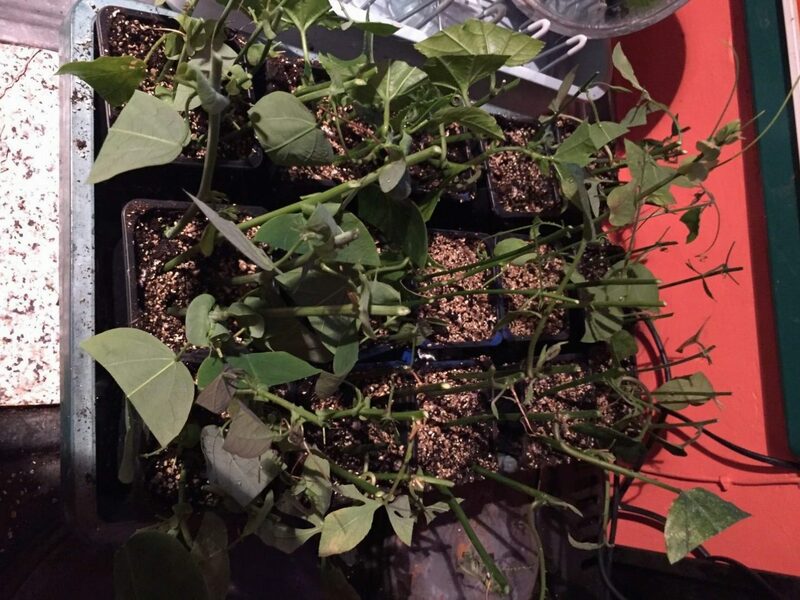 And I even got to ask a question about Passiflora seed germination! GQT iPlayer recording. 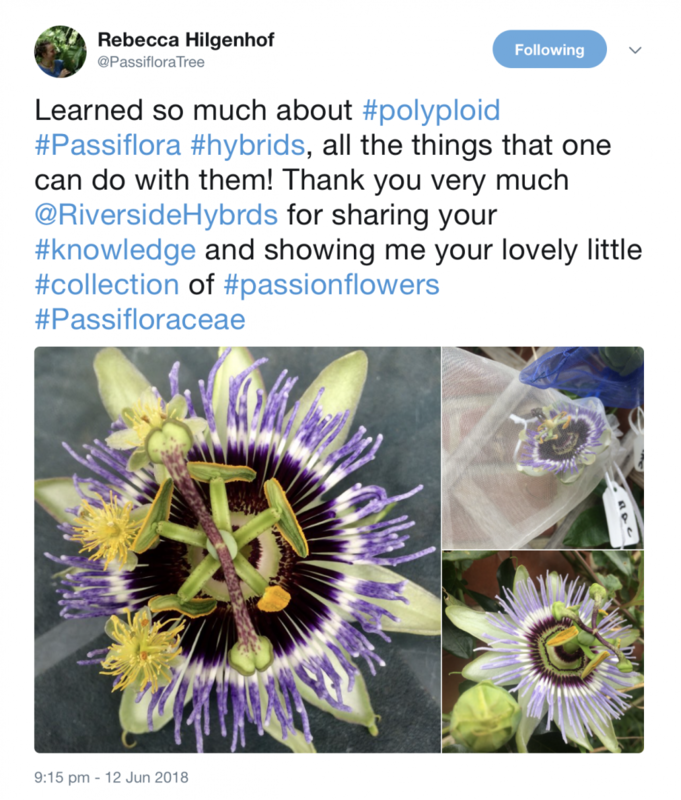 Great to see the Riverside® Passiflora hybrids slowly spreading worldwide. Available in Europe everywhere from France, Germany, Hungary, Poland, Spain, Switzerland to UK and more. 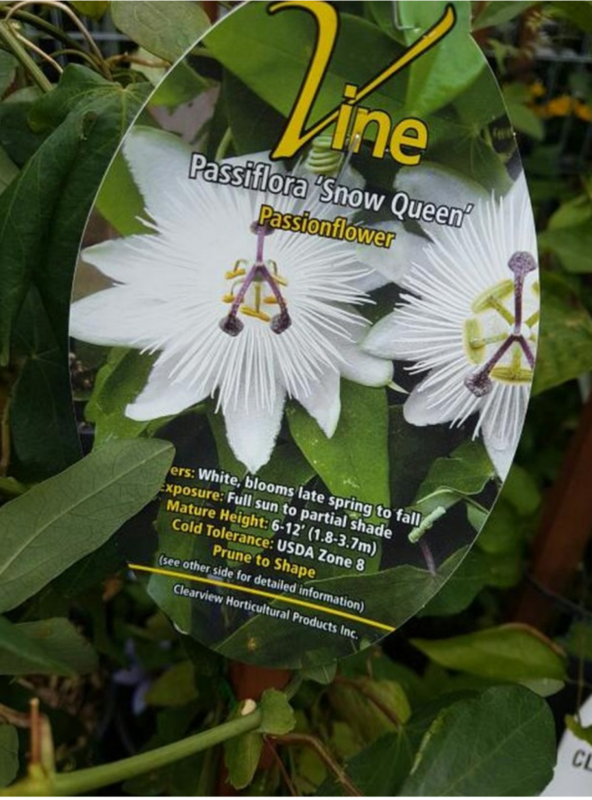 In USA Passiflora enthusiast Dan Pogust has just spotted Passiflora ‘Snow Queen’ is in stock now at Pistils Nursery in Portland Oregon, USA. Thanks for the pics Dan! 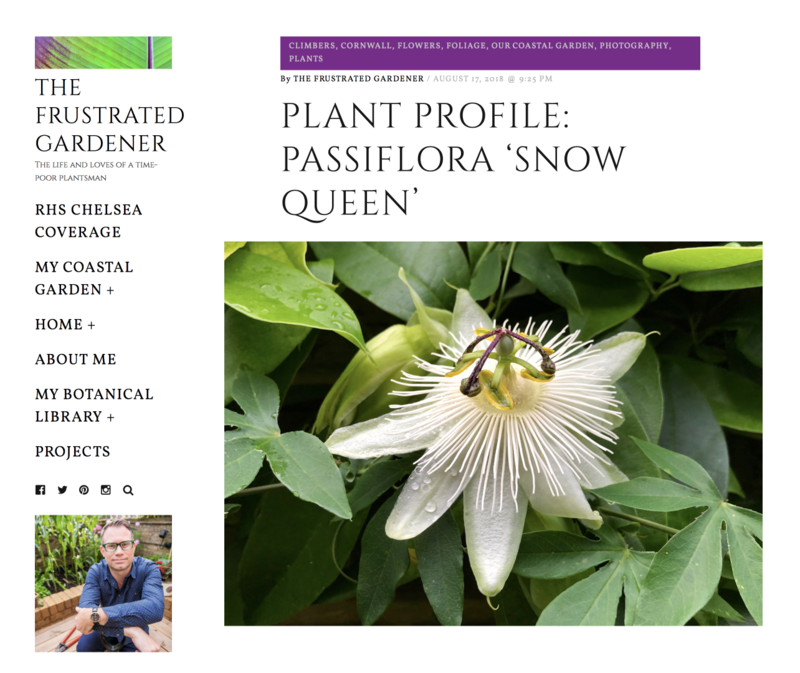 Lovely to see an article in Garden Design Magazine on growing Passion flowers and featuring Passiflora ‘Snow Queen’. 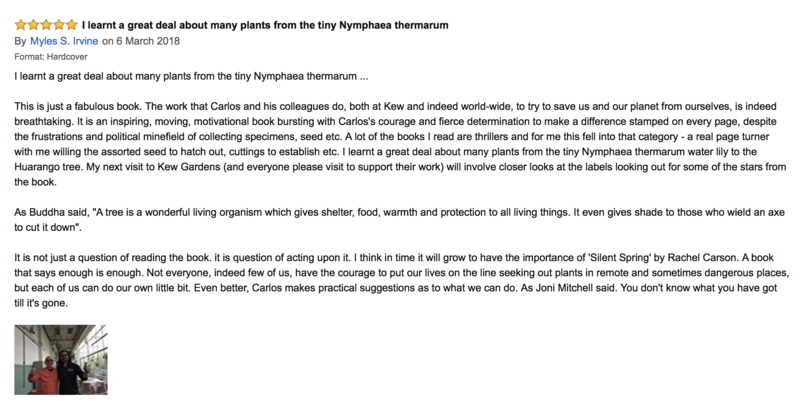 I’ve just read Carlos Magdalena’s book, ‘The Plant Messiah’. 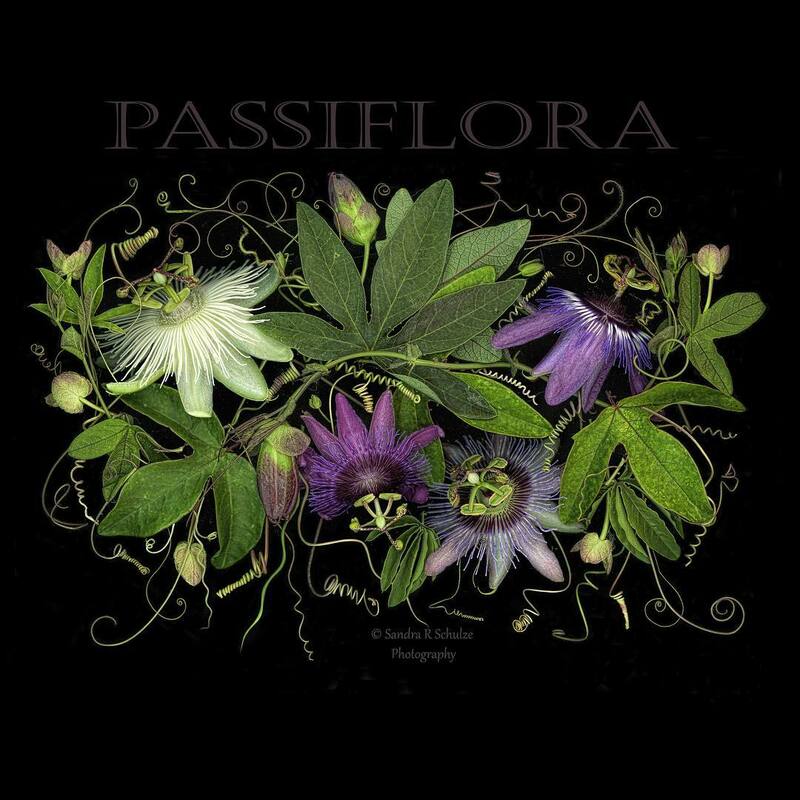 Inspirational in so many ways including various thoughts re my Passiflora breeding. A book that says enough is enough. Not everyone, indeed few of us, have the courage to put our lives on the line seeking out plants in remote and sometimes dangerous places, but each of us can do our own little bit. See my review. 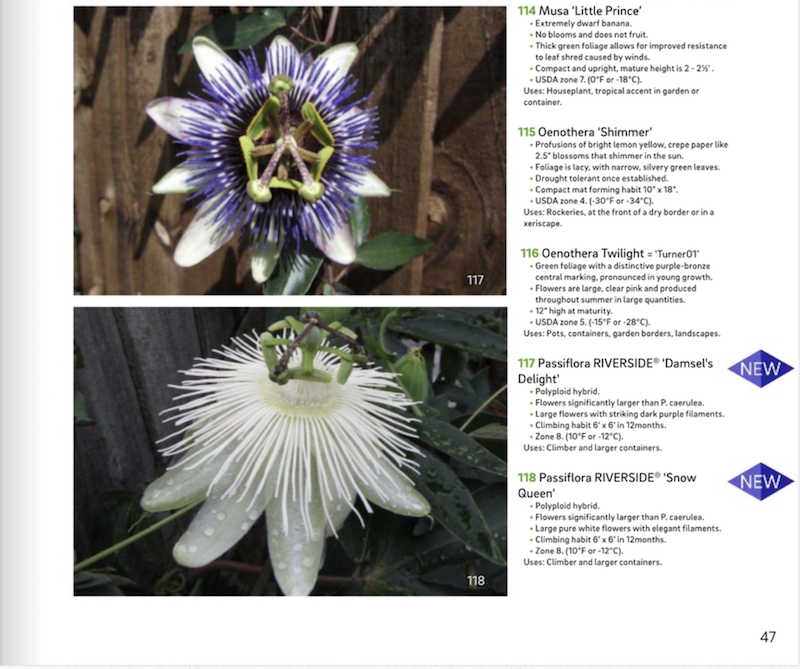 Great to see the Riverside® Hybrids Passiflora ‘Damsel’s Delight & Passiflora ‘Snow Queen’ in the 2017-2018 PlantHaven Premium Plant Catalogue. Each year sales are building with increasing availability throughout Europe, Canada & USA. Check out out list of some of our bigger Wholesalers here. 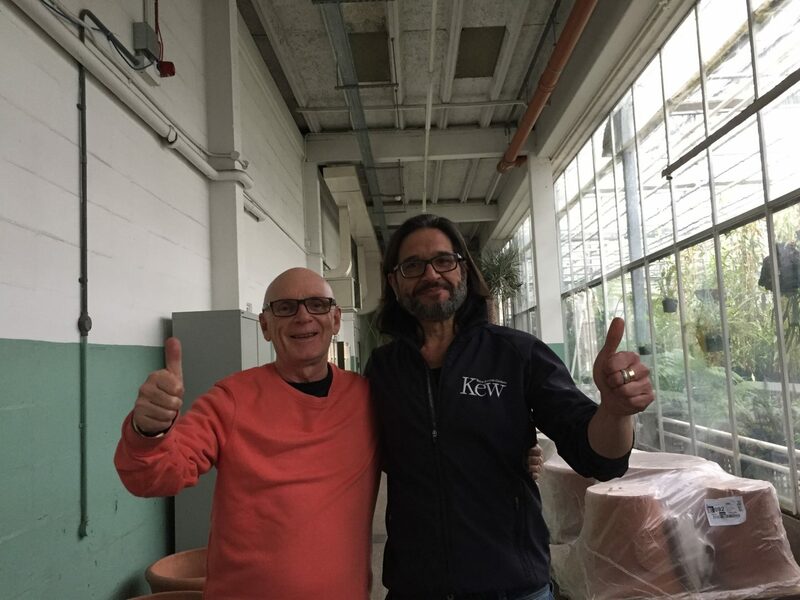 Surprise visit from Sergio Lloreda of Nature & more, commercial Passion fruit grower and exporter from Bogotá, Colombia. 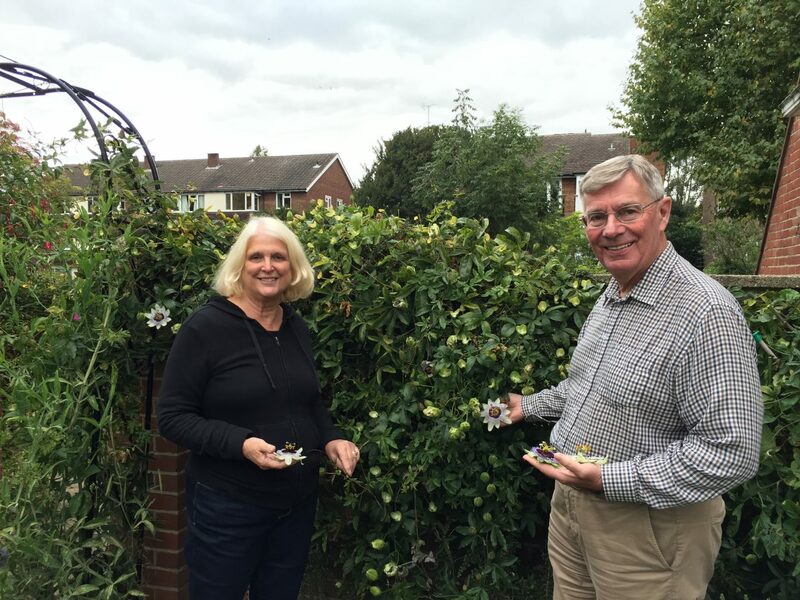 Great fun, a good exchange of info and an assortment of Passiflora chopped up! 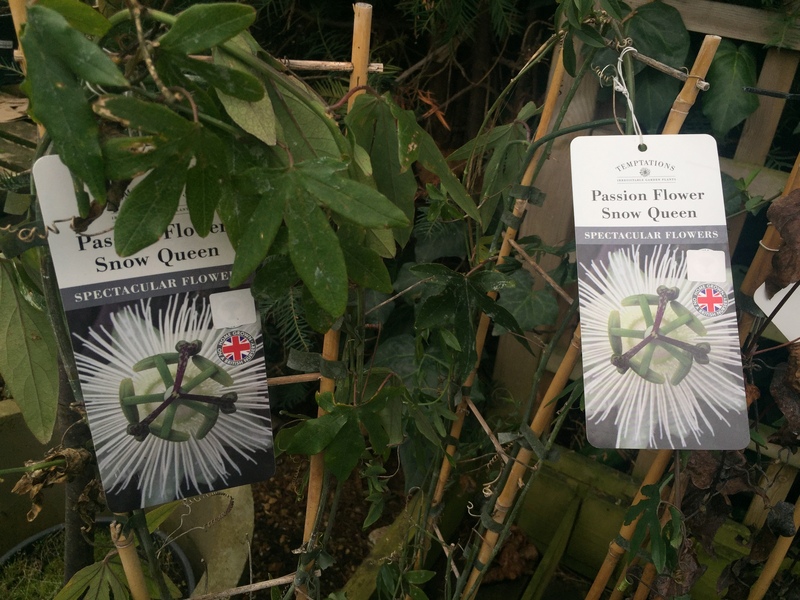 Plant Breeders Rights Granted (48,160) by CPVO for the Riverside® Hybrid Passiflora ‘Snow Queen’. This has been a long slow process but we got there in the end thanks to the endeavours of PlantHaven International,inc. 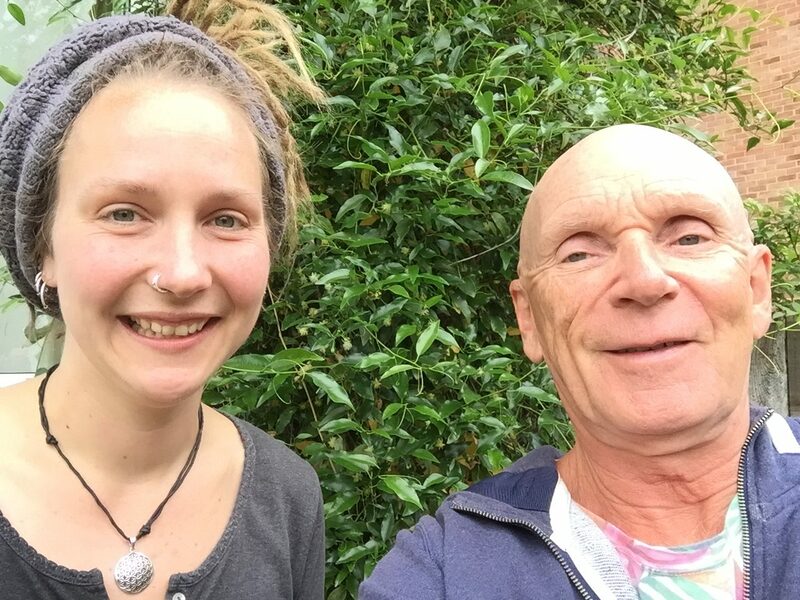 Picture shows breeder Myles Irvine with the ‘Snow Queen’ herself, Natalia Walaszek. The off season Well in a way but the work goes on. 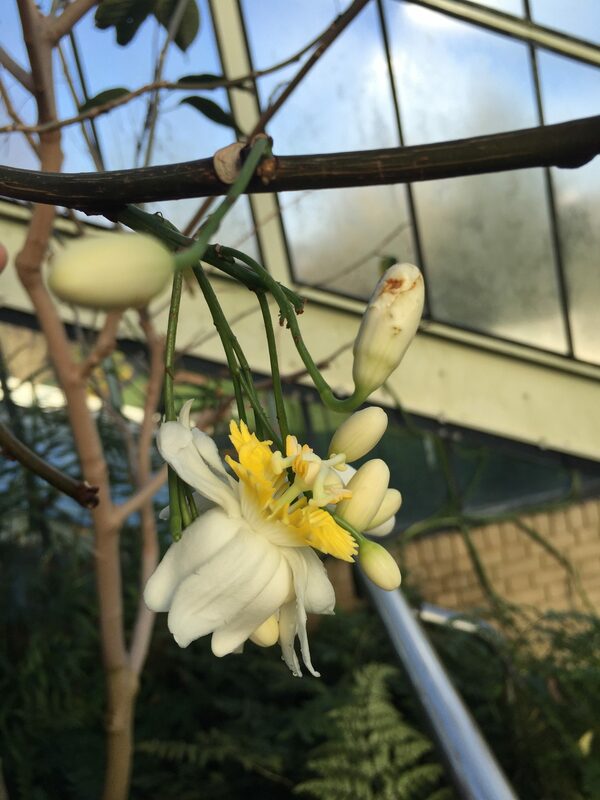 A surprising number of the more tropical species flower in December/January as flowering is triggered by shorter day length. 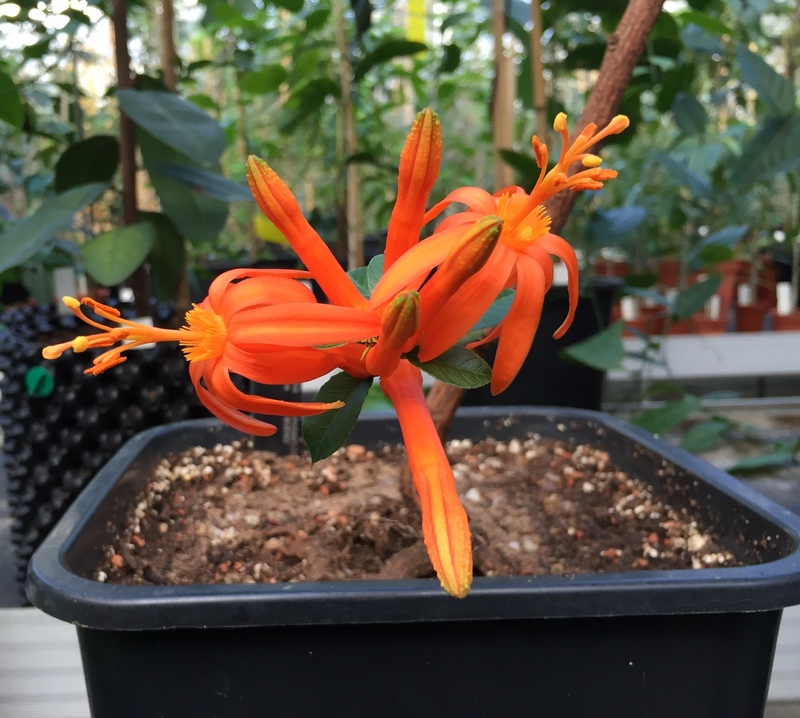 Pictures from 2017 of an interesting new polyploid hybrid. Unusual in that it does not open any further than this. Sleeves rolled up for a productive 2018. Only release the best! 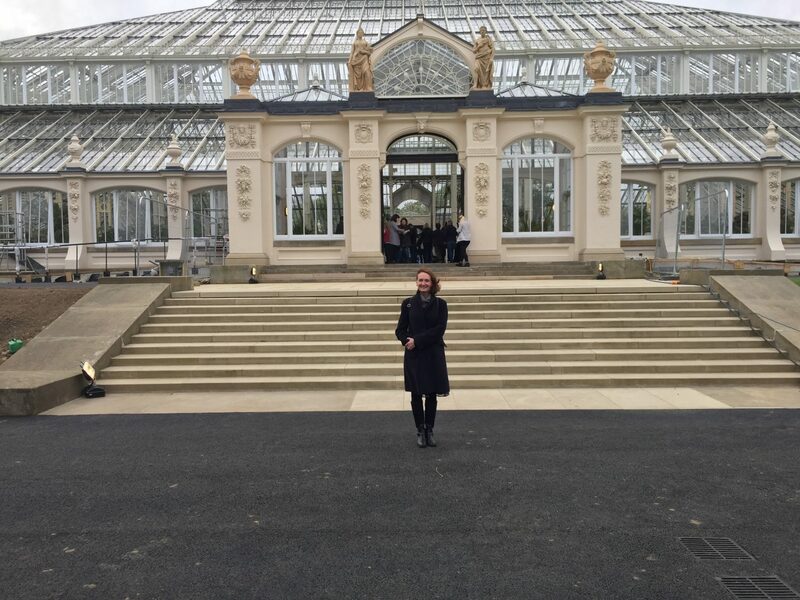 Royal Botanical Gardens Kew A fabulous behind the scenes visit to the nurseries at Kew catching up with both Rebecca Hilgenhof & Carlos Magdalena, author of The Plant Messiah. 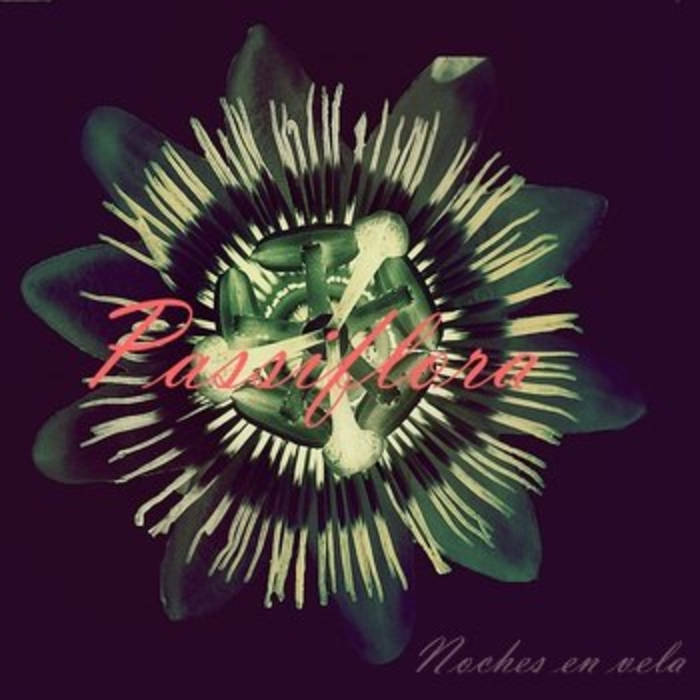 I saw more Passiflora than I could count and indeed many other incredible plants. A day to remember and good learning experience. 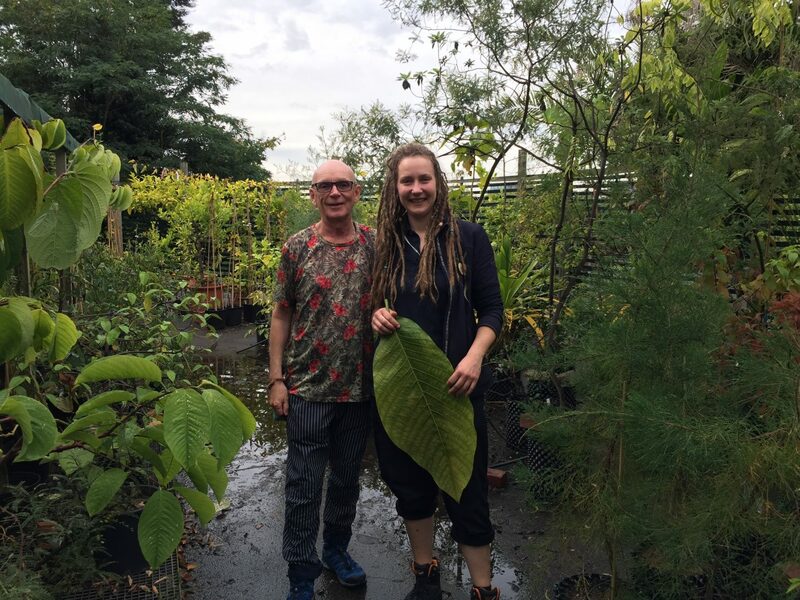 Picture shows Rebecca holding a huge Passiflora macrophylla leaf. 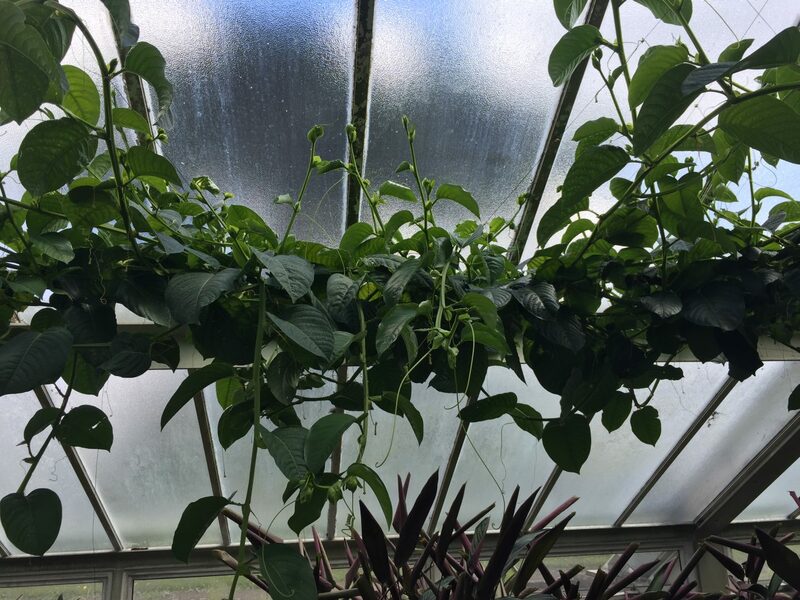 It is one of the Astrophea, which are trees rather than climbing vines. PlantHaven Geoff and Maureen Needham of PlantHaven International pop in for tea and cake from Carmella Patisserie. 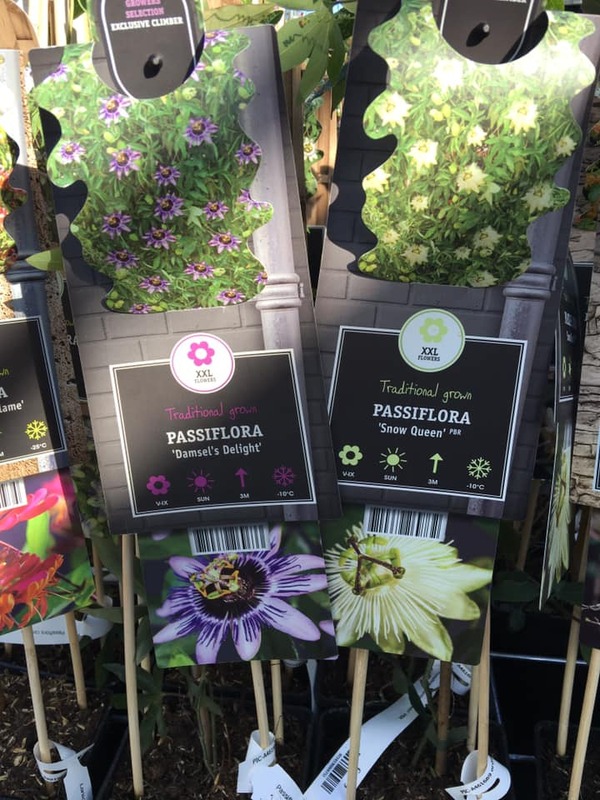 They also check out progress on adding new lines to the Riverside® Passiflora hybrid range. Plantarium Trade Fair. 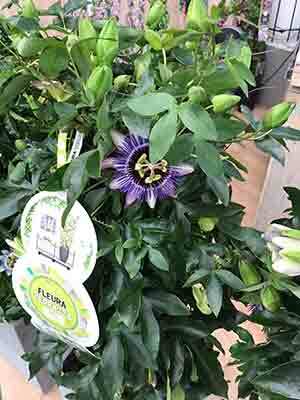 The Riverside® Hybrids Passiflora ‘Damsel’s Delight & Passiflora ‘Snow Queen’ have been added to the prizewinning FleuraTerraza range by Dutch climber specialists Van der Starre. 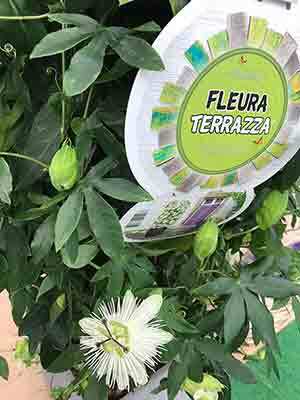 FleuraTerrazza includes a range of climbers selected to ensure they will bloom in spring, summer and after summer.